Alaska Power & Telephone Company (APTL) has been scratching out an existence in the Frozen North since 1957. The company’s business model is simple: generating electrical power and providing telecommunications services to many small communities on the Pacific coast of Southeast Alaska and the interior. The company is largely employee-owned and has deep ties with the communities it serves. Though electric generation and telecom services are hardly growth business, APTL has been aggressive in driving change and improving service. APTL’s power generation assets are nearly all hydroelectric, a big change from just a decade ago. While the traditional wireline business is eroding, the company has added broadband services and is continually upgrading its network to add to the non-regulated broadband business. In order to understand APTL’s structure and behavior in recent years, a quick history lesson is in order. In the years prior to 2001, APTL had been a frequent acquirer of small communications and energy companies in Alaska. These acquisitions were funded mainly by debt, eventually leading the company to be 78% liability-financed at the end of fiscal 2000. At that point, attractive acquisitions were nearly exhausted and the company’s large dividend put pressure on the company to find new and diversified revenue sources. Rather than exercising discipline by slowing growth, cutting the dividend and devoting cash flow to debt reduction, the company spent millions to purchase a firm with hydroelectric operating in South America and purchased a minority stake in Summit Alaska, a civil construction firm. In nearly no time at all, Summit Alaska went bankrupt. This caused APTL to violate its debt covenants with its primary lender, sending APTL itself into Chapter 11. Amazingly, the company exited bankruptcy proceedings a short while later with the equity completely intact. APTL’s profitable electric and telecom subsidiaries were its saving grace. The company agreed to make periodic payments to its bankruptcy claimants from available cash flow until 2013. APTL recently paid off the last of these claims two years earlier than planned. In the wake of the bankruptcy, the company undertook positive corporate governance changes, separating the CEO and chairman roles and installing a new board. Since then, the company has focused on streamlining operations and deleveraging, with an ultimate equity target of 40% of capital. Growth has been slow but steady at around 4.4% annually. Annual net income has roughly doubled in the last decade, but is hardly consistent. The harsh climate and unforgiving environment in which APTL operates makes maintenance expenses highly unpredictable. The company explains that the Alaskan economic environment has been poor which makes it all the more impressive that the company has managed to grow. Any turnaround could improve the company’s operating results. Since bottoming in 2002 in the wake of bankruptcy, the company has more than doubled book value per share to $22.93 at quarter’s end, an annual growth rate of 9.1%. Unspectacular, to be sure, but it should be remembered that the company has been burdened by its unprofitable HydroWest subsidiary (South American hydroelectricity, now spun off to investors) and its broadband segment has only recently approached profitability after years of capital investment. The company has more than doubled the equity proportion of its capital and is well on the way to achieving its deleveraging goal. One interesting balance sheet component to note is the company’s investment in its primary lender, CoBank. CoBank is a private, cooperative bank that is part of the Farm Credit system, created by the government to encourage lending to farms and rural infrastructure projects. CoBank’s earnings are distributed to its borrowers, based on their loan balances. In the past twelve months, APTL earned $529,000 in dividend income from CoBank. Part of this is paid in cash and part shows up as ownership in CoBank. I have no idea what would happen to this ownership in a sale or liquidation of APTL, but this income from CoBank is real and material to APTL’s earnings, providing a nice offset to interest paid on borrowings. Another important consideration is APTL’s recent spin-off of HydroWest. Due to a disagreement with CoBank, APTL was forced to divest HydroWest. The company did so by distributing common stock to investors, while retaining HydroWest’s newly-created preferred stock. Frankly, the divestiture should have happened long earlier. HydroWest never produced a dime of operating profit for APTL, and offered no synergies at all. Its existence was a legacy from APTL’s ill-fated diversification efforts of a decade ago. APTL’s profits and and leverage will improve going forward in HydroWest’s absence. APTL stock’s current bid/ask midpoint is $17.55. With an earnings yield of 12.2%, even a modest earnings growth assumption of 2.2% (half of historical revenue growth) implies an annual return of 14.4%. 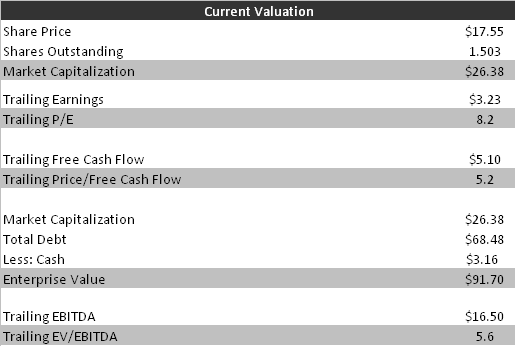 APTL’s valuation is very low for a stable regulated utility/telecom company. The company’s gradual deleveraging is wise and will likely continue until the company reaches a stable capital structure. At that point, I expect the company will reinstate its dividend and trade more in line with peers. This process could take several years, but in the meantime I expect the company’s slow but steady growth to continue. The recent completion of the company’s Southeast Alaska Microwave Network (SAMN) broadband data project could provide a kick for telecom growth and profits as well. At the current valuation, I think Alaska Power & Telephone represents a low-risk opportunity with above-average return potential.